Voting Rights Act: What’s lost if the Supreme Court kills it? What’s Lost if the Voting Rights Act Falls? Minority voters will lose a key bargaining chip. 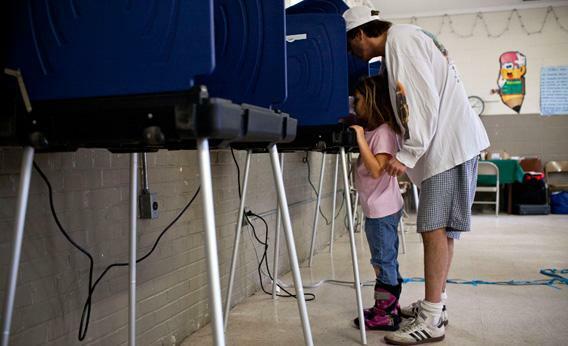 Brad Wallace and his daughter vote in the South Carolina primary in January 2012. Like other states with Republican majority legislatures acting over the last few years, South Carolina adopted a tough photo identification law before the 2012 election. Photograph by Andrew Burton/Getty Images. The U.S. Department of Justice blocked South Carolina’s voter ID requirement under Section 5. The process sounds technical, but it’s important. Nine full states and parts of other states with a history of racial discrimination in voting must get approval from either the Department of Justice or a three-judge court in Washington, D.C. before making any changes in their voting practices and procedures—from changes as small as moving a polling location to as large as enacting a new redistricting plan. The states and localities covered by Section 5 must prove that any change in voting rules it proposes will not have the effect, and was not enacted with the purpose, of making minority voters worse off. The original point of this law, when it first passed in 1965, was to stop an old cat-and-mouse game in which the federal government sued racist Southern states to stop discriminatory voting practices—and after the feds won, the states would just enact a slightly different discriminatory law in its place. Today, the law prevents these jurisdictions from slipping back into that pattern. South Carolina’s voter ID law allowed election officials to accommodate voters who had “reasonable impediments” preventing them from getting the type of photo ID needed for voting. DOJ still objected, as did legal organizations representing minority voters. And because of Section 5, South Carolina had the burden of showing that the voter ID requirement did not discriminate. As DOJ’s case against South Carolina proceeded, the state watered down its law making it easier for people without photographic identification to vote through expanding the “reasonable impediment” provision. The court eventually approved South Carolina’s law for use in 2013—but only because Section 5 spurred those changes. As Judge John Bates observed: “Without the review process under the Voting Rights Act, South Carolina’s voter photo ID law certainly would have been more restrictive.”* The winners are the minority voters in South Carolina who ended up with a much better law. The metamorphosis of South Carolina’s law was unusual because it occurred in public view. More routinely, Section 5 prods states to revise laws to satisfy DOJ and minority voters in a process that takes place within the DOJ review process. It’s more informal, and also less expensive than going to court, with DOJ soliciting input from groups representing local minority voters. Section 5 gives these groups leverage to negotiate changes—they have a seat at the table, which they don’t have in many states not covered by Section 5. When minority groups complain about a proposed voting change and DOJ agrees with the complaints, states will often change their laws, or withdraw their requests to change the law entirely. DOJ doesn’t even have to formally object: As Luis Ricardo Fraga and Maria Lizet Ocampo found, states often revise or withdraw their proposed changes after DOJ simply asks them for more information about how their proposals will affect minority voters. It’s a thumb on the scale that matters. Voter ID laws have also passed outside the South in recent years, in states such as Indiana and Kansas. Because Section 5 doesn’t apply there, no federal law prevents the voter ID requirements from going into effect, though some state courts have blocked them for other reasons. By contrast, because of Section 5, South Carolina’s law automatically went on hold until it was softened. Texas, meanwhile, lost a bid to impose an even stricter voter ID requirement enacted in 2011. In the Alabama case that the Supreme Court will hear at the end of February, the key issue is not whether minority voters still need a bargaining chip to avoid rollbacks in voting rights. Instead, the question is whether Congress has the power to force only certain states and areas—mostly the Southern states that discriminated against minority voters 40 or 50 years ago—to go through a process that other states don’t have to follow. The court could well conclude that Section 5 is no longer correctly tailored for modern times. A lot has changed in the South. On the other hand, maybe not enough has changed. In 2012, Texas not only lost the case over its strict voter ID law, but also, in a separate case, was found to have engaged in purposeful race discrimination in redistricting, by drawing district lines to remove business districts (what the court termed “the economic guts”) from African-American legislative districts. The court said the state was making it harder for these legislators to raise funds and to promote economic growth in their districts. Texas has appealed both defeats to the Supreme Court. There’s no question that voting is far from perfect in states beyond Section 5’s reach. The long lines at polls in states like Ohio and Florida this past Election Day made me long for stronger nationwide protections for voting rights. But that’s a reason for Congress to do more—not for the Supreme Court to take away one of the key tools minority voters have in part of the country.